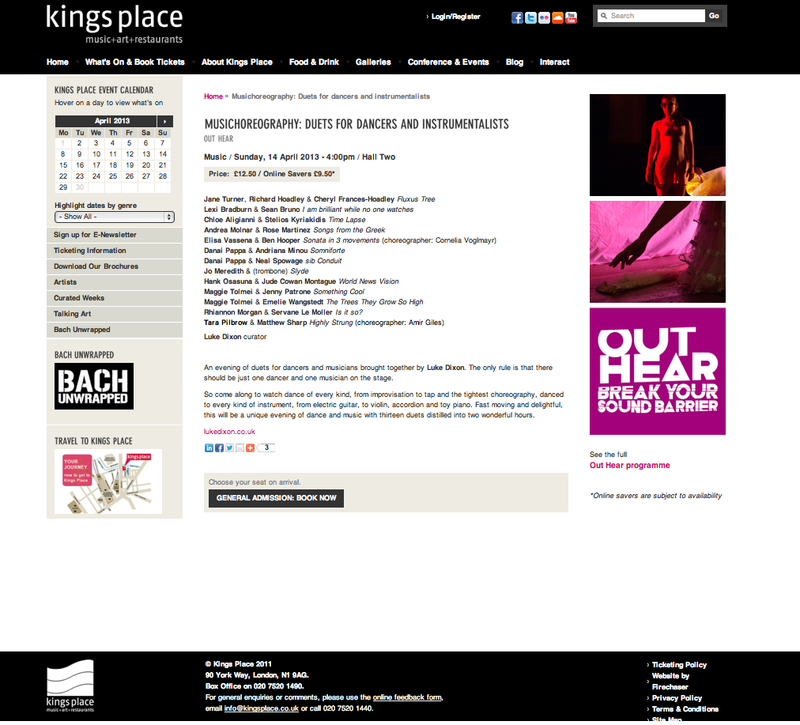 A composer in many media and technologist, early instrumental compositions include Only Connect (1988), for orchestra, recorded by the BBC Symphony Orchestra and broadcast on BBC Radio 3's Music in our Time, In Principio (1989) performed by the BBC Singers at the Huddersfield Contemporary Music Festival and Three Pieces for Two Pianos (1992). In recent years Richard Hoadley has focused on the role of technology in musical composition and performance. This includes the implementation of physical interfaces along with algorithmic software to generate original compositions. He has developed a number of devices including the Digiphone (2011-2014), the Gaggle (2009) and the Metapiano (2011): bespoke systems designed to investigate and facilitate physical interactions with musically expressive algorithms for installations, performances (including dance) and therapeutic environments. These interfaces and others have been used creatively in performances such as Triggered (2009-2012). 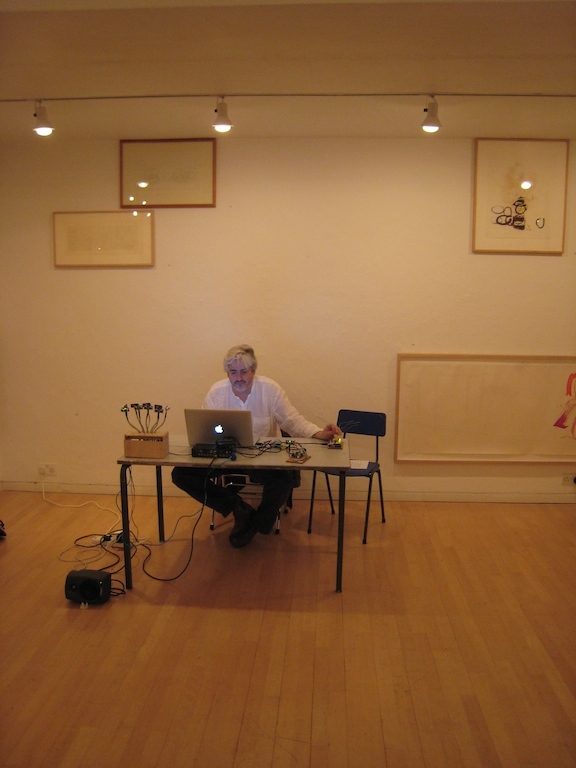 In compositions such as Calder's Violin he has developed methods for the live presentation of algorithmically generated notation, an approach he has developed further in pieces such as The Fluxus Tree (2012-13), Three Streams (2013), Quantum Canticorum (2013-2014), Semaphore (2014) and Choreograms (2016) in which the movement of dancers generates music notation which is in turn performed live by an instrumentalist. In the last four of these pieces he has acquired movement data using the Kinect depth camera. Current projects include the composition of an extended choral work, Unthinking Things, for 16 voice choir, electronics and live, dynamic notation, based on texts by Bishop George Berkeley. He is also working on commissions involving the 'translation' of text and phonemes into musical ideas and gestures and the development of music and text compositions enacted by members of the audience moving through the performance space itself. The Touching Sound project investigated the use of these technologies in therapeutic environments. Ways of Making People Move investigates musical representation in composition and automatic scoring. He primarily works with SuperCollider software and Arduino, Mbed and Kinect hardware where necessary. He has written, published and presented about music throughout the world. A full list can be found below. Class for interfacing SuperCollider with various features of the INScore augmented score programme, notably live notation support via Guido. Used in most compositions since 2011 (Calder's Violin). Utility for converting HID messages to OSC, in this case for use with Isadora 1.2.9. From v1.3 Isadora has native support for HID. Software interfaces for music performance. Used in Triggered. Software interfaces for music performance. Used in Triggered and One Hundred and Twenty-Eight Haiku. Hardware and software interfaces, composition for performance and dancers. With Tom Hall, Jane Turner, Cheryl Frances-Hoad, in development June. Composition including hardware and software, and performance. Invited performance using custom built hardware and software, AHRC Workshop, 22nd-23rd March. Silent Histories: soundscapes and compositions on the themes of stillness, technology and place. Generate (nonsensical) text based on the content of input text. Applying the principles of Arpeggiator to the synthesis structure of the Yamaha SY77 or SY99 synthesiser. You'll require access to (at least) one of these synthesisers to fully appreciate this software. I'm currently working on software that doesn't require an external synth. involving tone colour as well as pitch material. More recently I've been redeveloping this in MaxMSP and will probably do so again using SuperCollider. An algorithmic MIDI composer based on the idea of the movement from one note to another in groups. Originally completed in Hypercard for Mac, later implemented in Visual Basic on Windows. Screenshots. Download. Many of these devices have been used in the music-dance performance piece, Triggered. (2011) Metapiano sculptural hardware interface. Also a number of smaller, portable, minimetas. The Body in the World - The World in the Body. 13th International EABP Congress of Body Psychotherapy. 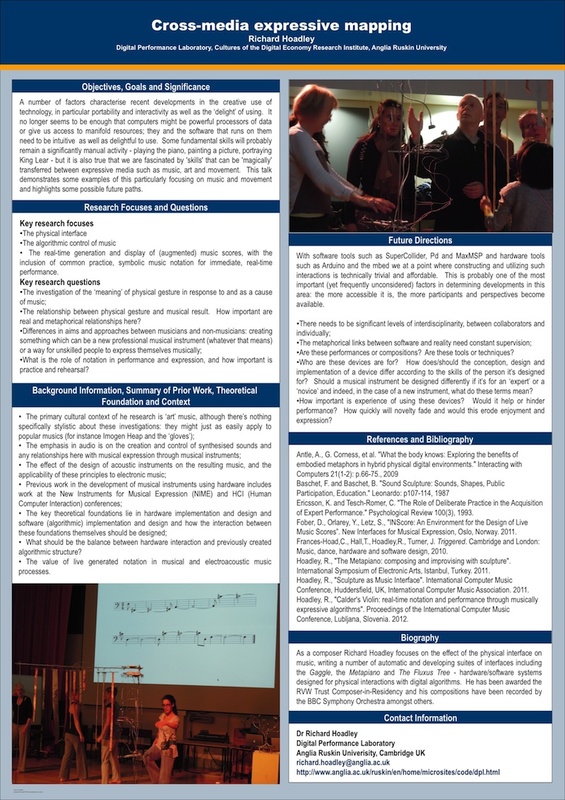 (2014) Dynamic Music and Notation Through Technology Workshop presentation by Richard Hoadley. (2014) Can we live without rhythm? Talk by Satinder Gill and Richard Hoadley. This research seeks to describe, implement and analyse work that investigates unique methods of articulating and implementing expressive gesture through physical interaction with objects. Led by Richard Hoadley and Satinder Gill. Anglia Ruskin University, 21st June. Exploring sensor technologies in developing new composition, resulting in a performance sharing. London Metropolitan University, 9th June. In collaboration with Tom Hall, Cheryl Francis-Hoad and Jane Turner and dancers. with Andrew Sparling (clarinet), 22nd February. (2016-17) Scientific committee member of Electronic Visualisation and the Arts conference. PRS New Music Awards Application, 8th January. Advisor for British Telecom 'Understanding the Future' conference, Cambridge. (2008) Consultant on programme concerning use of sensor and EEG data on Radio 209 in Cambridge.